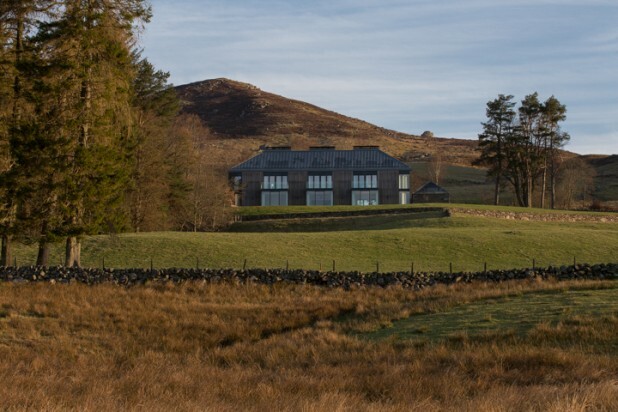 The existing farmhouse and steading were located amongst the beautiful Perthshire landscape. 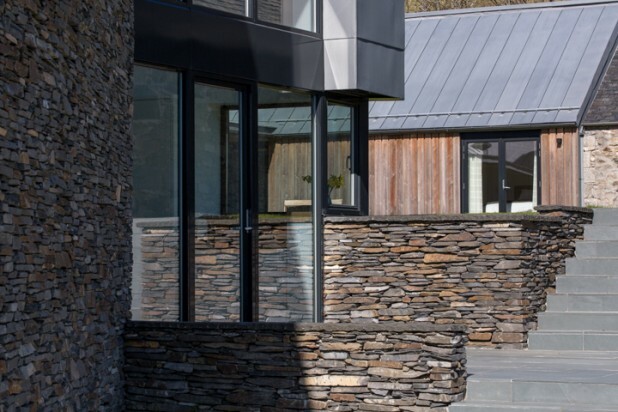 The client was keen to make more of the site, which the Victorian farmhouse and its many clumsy extensions did not address, and the fabric of which had fallen into disrepair. 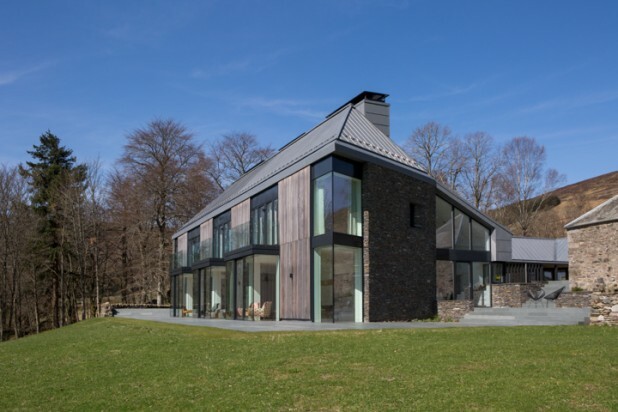 Cameronwebster architects were given the brief to demolish the existing house and reconfigure the surrounding steading to create a series of spaces to accommodate the extended family and friends for holidays and weekend walking parties, based on a sketch scheme designed by Marcus Lee. 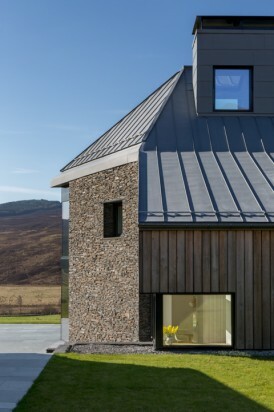 The steading courtyard was retained, which allowed the new building to utilise the level change and create a distinction between the luxurious living accommodation to the front of the house and the service accommodation to the rear. 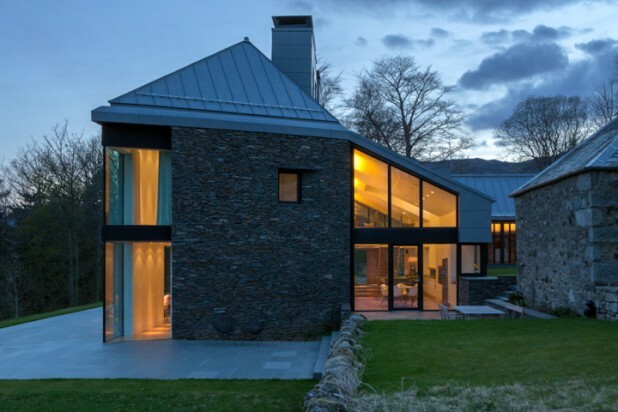 The kitchen extends along the entrance axis with views to the west and also to the grassed courtyard above. The service accommodation creates a generous series of spaces to allow for changing into walking clothes, storage of boots & equipment and drying rooms. 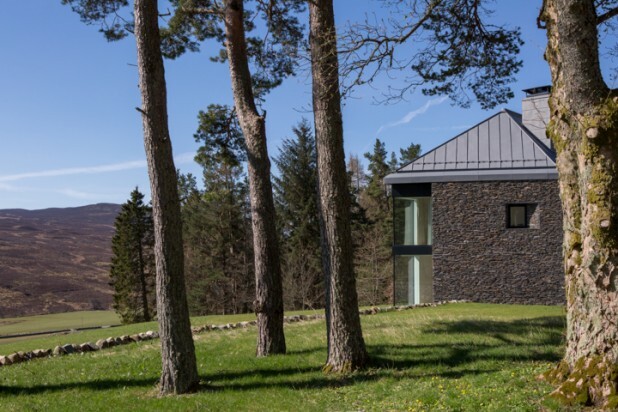 The materiality both internally & externally of these spaces is kept simple with vertically clad untreated larch. The large public rooms in the south-facing front of the house are linked with an enfilade formed by sliding doors and are set lower than the entrance level, to give a separation from the everyday and a direct exposure to views of the surrounding landscape. The central separating cores clad in vertical boarding contain a pantry, AV storage, and a cloakroom, while incorporating large doors along their sides to allow the public rooms to be closed off from the kitchen area .The bedrooms are accessed via a grand stair in the main central space and at each turn there is a view captured through carefully placed windows. The bathrooms are located above the central cores, allowing the mechanical & electrical services to be efficiently considered. 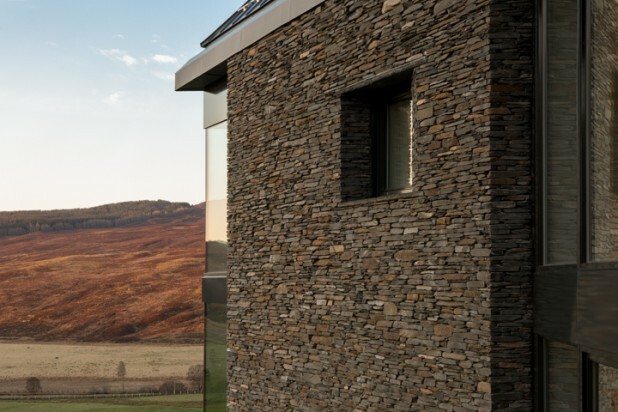 High-level windows within the internal bathrooms allow for dramatically reflected views to the hilltops and sky through mechanically operated mirrors.